Holiday hours and during the winter months, please call in advance to confirm. Thank you. We are Canada's Sport Boating Superstore. 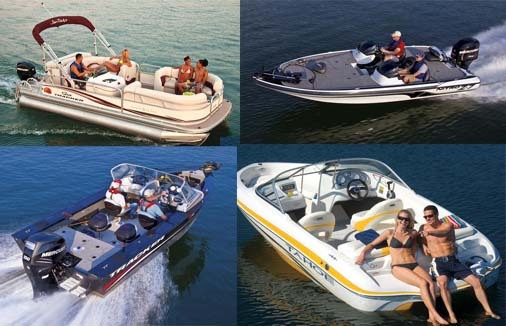 Boatland Canada has been selling boats since 1983. Thousands of people have saved hundreds, and even thousands, of dollars on all our popular brands of pontoon, bowrider, sport-fishing, combo, and utility boats. Boatland Canada is now located 100 meters north of the 4th Concession cloverleaf at 4177 Highway 115/35 on the east side of the median, on northbound lanes. We of course welcome all new and repeat customers. We will continue to provide our customers with a wide selection of bowrider, pontoon, fishing boats, ski/fish combos, and utility boats at the lowest prices possible. We select only top quality products to feature for our customers. We will provide our customers with sound knowledge of boating, and direct the sale to custom fit your purchasing preference. You will be provided choices that will custom fit your specific boating requirements based on the information provided to us. We also sell your used boat on consignment for you! Bring us your used boat and we will work hard to get it sold for you. Our satisfied customers have made us one of the largest dealers in Canada allowing us to provide the best products at the best prices. The friendly, professional staff members at Boatland Canada are always here to answer your questions about boats and all your boating needs. Come in and browse around. We are open seven days a week, but check our website for holiday and vacation hours notifications. Value Prices are displayed without dealer prep and freight charges. Prices, specifications, and features are subject to change without notice. Tax, title, registration, documentation and license fees vary by situation and are in addition to prices shown. Photos may show optional equipment. All trademarks, trade names, service marks and logos may not be utilized in any manner, without the advance written consent. Any unauthorized use of the content and materials located on this site will violate intellectual property rights with respect thereto and is strictly prohibited. As a visitor of this site, you agree that any viewing, printing or downloading of the content and materials located on this site is limited to your personal use in connection with prospective purchases of our products and no other. Except for the limited rights granted to you as a visitor of the site, all other rights with respect to the site are expressly reserved. Best efforts are used to ensure accuracy in specifications, features and pricing presented here; nevertheless, always check with sales people and the manufacturer regarding specifications, features, pricing and with respect to any discrepancies that may appear on this site. WE DISCLAIM ALL WARRANTIES WITH RESPECT TO THE CONTENT AND MATERIALS CONTAINED IN THIS SITE INCLUDING ANY WARRANTY OF MERCHANTABILITY OR FITNESS FOR A PARTICULAR PURPOSE OR THAT THE SITE WILL BE OPERATED ERROR-FREE OR IS FREE FROM VIRUSES OR OTHER HARMFUL COMPONENTS. AS A VISITOR TO THIS SITE, YOU AGREE TO BE SOLELY RESPONSIBLE FOR ANY DAMAGE TO YOUR COMPUTER SYSTEMS OR DATA LOSS AND TO INDEMNITY AND HOLD US HARMLESS IN THE EVENT SUCH OCCURS AS A RESULT OF YOUR USE OF THIS SITE.